Woad leaf is also one of awesome medical herbs, which is widely used in many proven ancient herbal formulas. In TCM, it is commonly called Da Qing Ye. 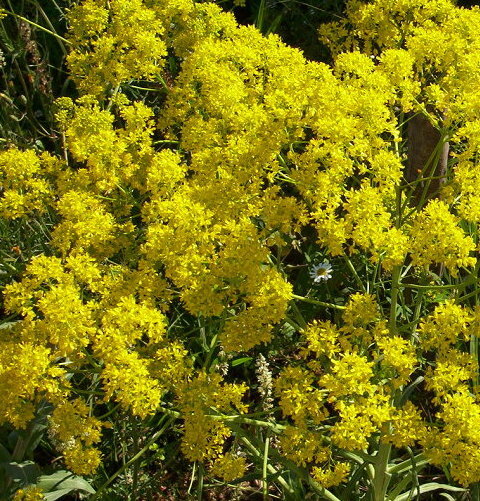 Woad is an ancient medicinal plant with potent anti-inflammatory and anti-allergic properties. As a member of the cabbage family, it is a much more powerful cancer prevention than its vegetable cousin broccoli. tattooing themselves blue. Best treated as a biennial. stand at least a foot apart. Sun essential. The leaves of this plant are the source of a blue dye, often used instead of indigo. Leaves are collected from flowering stems, dried in the sun, ground into paste and left to ferment. This produces a smell so disgusting that it was an offence in Tudor times to dry woad near the royal palaces. The fermented leaves are then formed into cakes, mixed with water and fermented again. The colour is drawn out by infusing the woad with lime water. As well as being used for clothing, woad was once used by Celtic warriors to stain their bodies during battle. Some historians think the word Britain came from this custom of war-painting, as the old Celtic for paint was Brith and Brithon meant stained man. In the 16th century Queen Elizabeth I issued a “Proclamation against the sowing of woade” (14th October 1585) because a lot of arable land was being turned over to woad production at a time when there was a shortage of food in Britain. With the introduction of synthetic dyes woad cultivation ceased in Europe.